– OER – a manufacturing company whose mission is to faithfully reproduce GM parts with an authentic appearance, quality and fit that meets or exceeds the original factory specifications. Based in Westminster, Calif., Original Equipment Reproduction was founded in 1993 to meet the needs for spot-on accurate GM reproduction parts in the GM enthusiast market. Today, OER is the most asked-for brand in GM restoration parts and has been recognized by the Automotive Restoration Market Organization as a leader in the industry. Creating an OER part typically follows one of several paths. Parts are “reverse engineered,” a process that involves dissecting the original item and developing the manufacturing steps to recreate it. Other components also are built using original GM blueprints; OER’s licensing agreement with GM allows access to these drawings. In some cases, OER will manufacture parts with the original tooling, as their partnership with GM provides access to retired GM tooling. Some items, such as fender panels, are manufactured using GM tooling – in GM plants located in Michigan. OER decides on which parts to create, by evaluating demand-and-supply: OER learns of the demand – and then supplies the part. It usually takes between three and six months to move from decision to finished product. The range of parts manufactured by OEM is extensive, covering nearly every element of car restoration – interior, sheet metal, trim pieces, and mechanical components. More than 10,000 parts are in the OER inventory, covering classic GM models like Camaro, Chevy II/Nova, Corvette, Chevelle/Malibu, El Camino, Firebird/Trans Am, Monte Carlo, full‑size Chevrolet Impala/Bel Air/Biscayne/Caprice, Chevrolet and GMC trucks and others. Many OER products manufactured for GM models are officially licensed by General Motors, ensuring the quality and authenticity of these parts. Moreover, every OER product is backed by a full one-year manufacturer’s warranty against factory defects and workmanship. 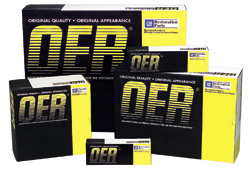 OER products are available at authorized restoration parts suppliers and select GM dealerships nationwide. Future plans for OER include further development of its part offerings for existing GM and Mopar lines while expanding into parts for Ford vehicles. Visit http://www.oerparts.com for more details.